** This 75-90 minute interactive personal safety awareness training coupled with hands-on instruction of personal safety techniques. Attendees will leave with 3-5 physical skills that could save their life in the event of violence both in and out of the workplace. Inclusive of all levels of physical fitness. Debbie Pickus has a black belt in Shotokan karate, has been a fitness professional for over 20 years and is the former co-owner of a Title Boxing Club. 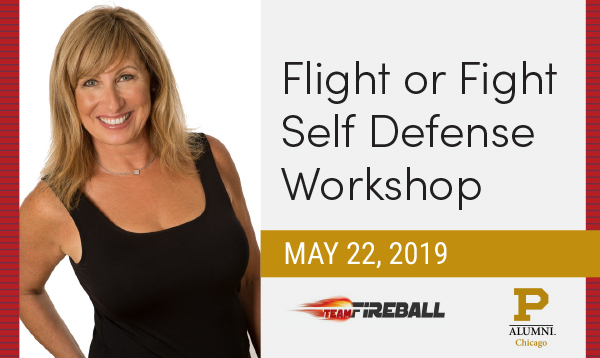 Her years in fitness and martial arts have given Debbie a unique perspective on the mind/body connection and how to use it as a power source. She works with and speaks to groups about harnessing this power to create confidence, energy and success in their business and personal lives. Her company, Team Fireball was founded with the concept of doing something unique, powerful and active to FIRE UP the average workplace team building event. It rapidly became much more. With the rise of workplace violence and the #metoo movement, physical and mental self- defense became the cornerstone of the business and companies are now understanding the importance of incorporating personal safety training for their employees. Her company has a mission to deliver these empowering programs to those affected by domestic violence, changing the mindset, self- esteem and belief systems of those who feel trapped by their circumstances. She has worked with many of the DV focused organizations in the Chicago area.